Sarah Chapman was an ice hockey player, and it’s what eventually led her into the tea business. As she put it, “I was an ice hockey player, so it was either hockey or tea.” If that seems like a non sequitur to you, allow Chapman to explain in her own words: “I played hockey for my first year on scholarship, and I was like what am I going to do with this? I wasn’t going to class.” So, she shaped up, started going to class, and began to explore her options. “I didn’t want to play sports anymore, but I did drive down to look around and I fell in love with UNCG. I landed here and had no ties. I didn’t know anybody. I was in the CARP program and I thought maybe I would design women’s hockey equipment. I didn’t want to do dresses,” she says. “That’s one of few of many directions that led me here,” she laughed. Chapman has a handle on the market, as she grew the store out of her success with hosting tea parties (not the kind with fancy hats, she’s quick to assure me) and wholesale accounts. With opening a physical location, however, Chapman had to consider a lot of factors, especially as a woman in her mid-20s who was still trying to figure things out. Things soon took off, thanks both to Chapman’s perseverance and the support of the community. “The local community in Greensboro is amazing. People are very supportive. 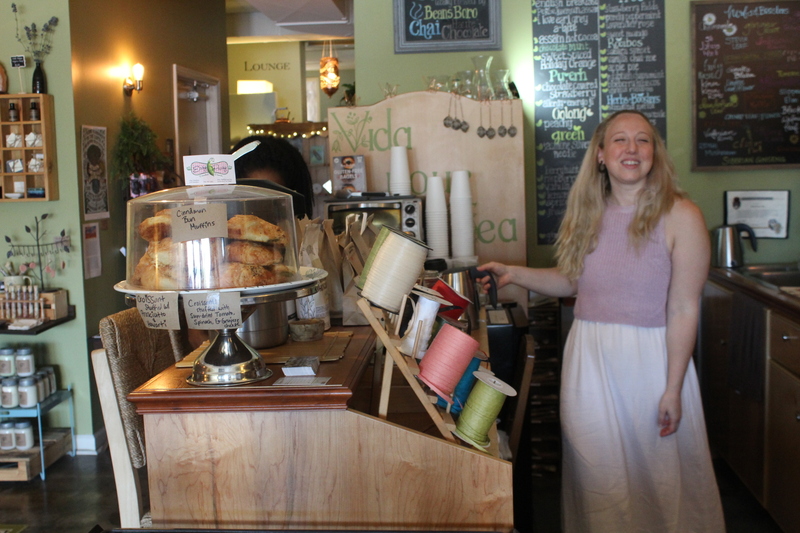 If you’re doing your own thing and you’re doing a decent job at it, they want to help share it and support you.” Country clubs in town, coffee shops, and restaurants all have wholesale accounts with Vida Pour Tea. “You have to have connections,” says Chapman. “You can’t be too competitive and Greensboro is spread out enough that no one’s stepping on each other’s toes.” Chapman lauds Greensboro on its willingness to incorporate local products on menus, like Goat Lady Cheese or bread from Camino. “If you go to a local restaurant, you’ll see something,” she says, crediting the town’s positive attitude towards helping others as playing an instrumental role in her success.